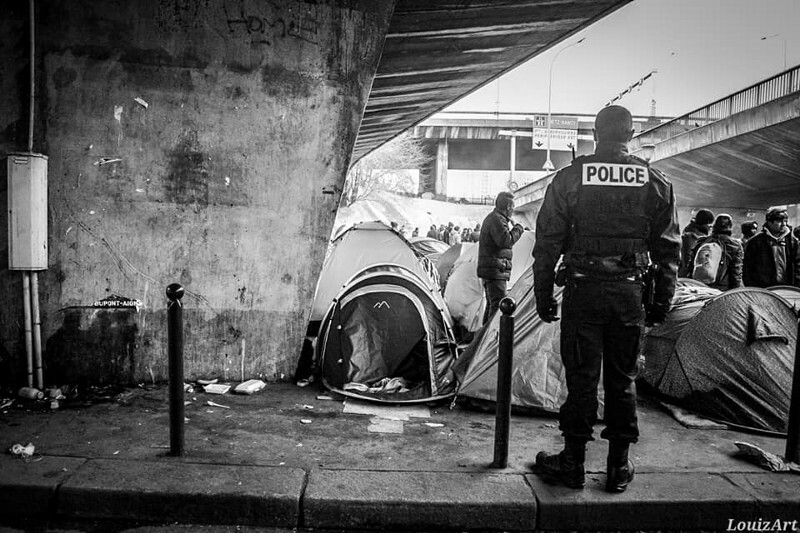 This is not a simple gesture of mercy by any means — Solidarité Migrants Wilson (Warning Facebook Link) notes that once news media left the scene, police began to check people’s documents, move people out of the area, and systematically destroy the tents left behind. FranceBleu has more information here (in French). “I’m coming back from the scene following the umpteenth red alert of this crazy day! So this time the story is: the #villedeparis came back to throw out the pallets that the refugees were starting fires with (because fire = danger… but also, fire=life when it’s so cold! ), and by the way, the city employees also tossed a few dozen tents on the east side and then left. A national police courier arrived right after, we approached to try our luck and understand a little bit of what was going on — they didn’t understand any more than we did. When it comes to police, I’ve seen everything since we started, but here, luckily, they were the nicest of all! Nice, and thus, like all those who possess a bit of cranial material, disgusted with all this nonsense, this inhumane policy (towards migrants) that’s also so expensive. See more photos of the situation at Porte de la Chapelle here (Warning Facebook Link) . Support the work of Cars of Hope with refugees on the Balkan Route. Even 1€ can make a difference.